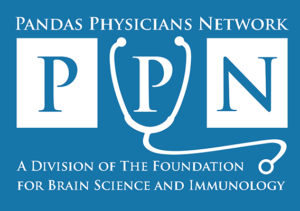 PANDAS Physicians Network (PPN) welcomes you to learn about our ongoing efforts to fulfill our mission to maintain the industry standard PPN Guidelines for Diagnostics and Therapeutics, foster continuous education and communication within the multi-disciplinary medical community and to sponsor research for developing diagnostic tests, treatment protocols and a cure for PANDAS/PANS within this generation. Below is a sample of what PPN has accomplished thus far in 2016. This outreach initiative is geared to reach medical professionals who are not familiar with PANDAS/PANS and/or want to learn what reliable resources are available for the medical community. Pediatrics: PPN continues to bring awareness to the medical community with a new full page ad in October’s issue of Pediatrics. Pediatrics is the official peer-reviewed journal of the American Academy of Pediatrics with a circulation of nearly 69,000 readers. This is PPN’s fourth printed ad in 2016. AAP News: PPN published a half page ad in March 2016’s issue of AAP News. This reached a potential 65,000 readers. A digital campaign followed with a potential of 100,000 views. 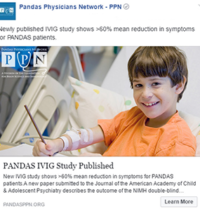 Social Media: PPN introduced a social media advertising campaign to assure relevant disciplines are aware of the current PANDAS IVIG study results. The ad reached 12,000 people. Email outreach allows the PPN message to find its way directly into the email inbox of physicians and medical professionals. Email alerts sent in 2016 have included: General outreach, “Seeing Your First Child with PANDAS/PANS”, and the PANDAS IVIG Study Results. National Association of Pediatric Nurse Practitioners (NAPNAP): PPN had two e-blasts sent to 3,000 pediatric nurse practitioners that are members of NAPNAP. Both emails were met with positive responses. Overall, PPN’s targeted pilots were successful with email open rates averaging 33%. The highest open rate was an impressive 63%. PPN is contemplating a wider reach for 2017. PPN published a new medical guide authored by Margo Thienemann, MD and The PANDAS Physicians Network Diagnostics and Therapeutics Committee in May 2016. Since publication, this document has accrued over 8,000 views. PPN added a new Grand Rounds/Video resource page on the PPN site. 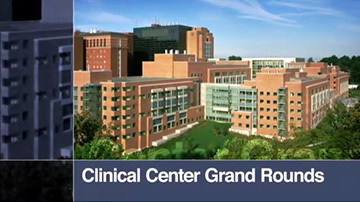 To date, PPN posted video from the University of Arizona and NIMH Grand Rounds. We are currently in discussion to obtain additional video presentations for inclusion. Educational material is in development. The goal is to have professional grade brochures created for the unique needs of Physician/Medical Professional, Researcher, and General Audience. An overview flyer has been developed and is available on the PPN site. Over 5,000 medical professionals had the opportunity to learn more about PANDAS/PANS at this year’s AACAP conference. PPN Special Advisor, Dr. Brian Fallon, and PPN Diagnostics and Therapeutics Committee members, Dr. Jennifer Frankovich, Dr. Daniel Geller, and Dr. Kyle Williams, presented. In addition to the PANDAS/PANS presentations, PPN exhibited a full length ad panel. CLICK HERE TO LEARN MORE. Over 100 knowledgeable doctors and medical professionals attended the PANDAS/PANS targeted conference on October 15-16, 2016. PPN featured a mounted poster display focusing on the symptoms associated with PANDAS/PANS and information on accessing the PPN diagnostic and therapeutic guidelines. CLICK HERE TO LEARN MORE. PPN provides grants for research that shows significant promise in the identification, treatment, and understanding of PANS/PANDAS. This year’s grant recipient for outstanding research was Dr. Jennifer Frankovich, Clinical Assistant Professor, Pediatric Rheumatology, Stanford Children’s Hospital for her work on Genetic Markers and Immunophenotypes associated with PANS. Early findings from the PANS clinic at Stanford show a significant correlation of a genetic marker in patients with PANS symptoms. 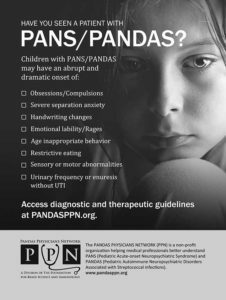 PPN’s goal is to help medical professionals understand, diagnose and treat PANS and PANDAS by providing to them quality research, diagnostic and treatment tools. Your donation dollars will help maintain PPN’s tools and further prove that the immune system can cause such psychological distress.